The Amazon Echo might be the Alexa speaker that started it all, but a different model can be credited for the explosion in popularity that Alexa smart speakers have seen in recent years. Amazon’s Echo Dot is an affordable speaker that’s compact enough to be placed anywhere, giving users access to all of Alexa’s smarts wherever they might be in their homes. 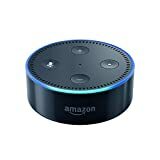 If you thought the Echo Dot was affordable before, however, prepare to be blown away because it’s on sale right now for Cyber Week at an all-time low of $19.99!